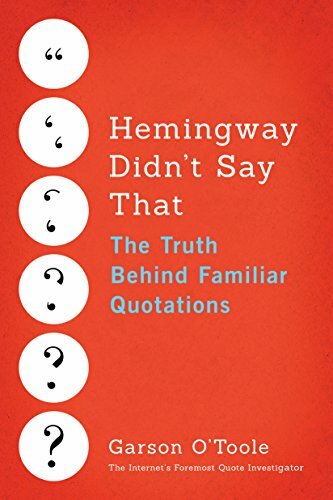 If you’ve ever googled a quote to see if it were misquoted or even true, you’ll find Hemingway Didn’t Say That: The Truth Behind Familiar Quotations fascinating. O’Toole gives a brief synopsis of his start in researching quotes and a explanation of how quotes become attributed to the wrong person or re-worded.Then he covers many familiar quotes grouped by how the misquote or wrong attribution evolved. This is really a lot of fun to read, especially if you’re anything like our family, whose ears perk up at certain points in the news or a show, questioning a quote. A mass scramble to Google via the nearest tech device ensues.We thought we were decently thorough diving back through multiple references to find each quote’s history. Due to this book, I’ll know to delve even further or jaunt over to O’Toole’s website to find a definitive answer. Garson O’Toole—the Internet’s foremost investigator into the dubious origins of our most repeated quotations, aphorisms, and everyday sayings—collects his efforts into a first-ever encyclopedia of corrective popular history. Containing an enormous amount of original research, this delightful compendium presents information previously unavailable to readers, writers, and scholars. It also serves as the first careful examination of what causes misquotations and how they spread across the globe.